For other uses, see Biscuit (disambiguation). American biscuit (left) and a bourbon, a variety of British biscuit (right) – the American biscuit is soft and flaky like a scone; whereas British biscuits are drier and often crunchy. Biscuit is a term used for a variety of primarily flour-based baked food products. The term is applied to two distinct products. This article covers the type of biscuit found in Africa, Asia and Europe, which is typically hard, flat and unleavened. 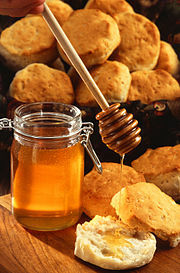 In North America, a biscuit is typically a soft, leavened quick bread, and is covered in the article Biscuit (bread). In Commonwealth nations and Ireland, a biscuit is a small baked product that would be called either a "cookie" or a "cracker" in the United States and most of English-speaking Canada. Biscuits in the United Kingdom, the Isle of Man and Ireland are hard and may be savoury or sweet, such as chocolate biscuits, digestives, hobnobs, ginger nuts, rich tea, bourbons, and custard creams. In the Commonwealth Nations and Ireland, the term "cookie" typically refers to only one type of biscuit (chocolate chip cookie); however, it may also locally refer to specific types of biscuits or breads. In the United States and some parts of English Canada, a "biscuit" is a quick bread, somewhat similar to a scone, and usually unsweetened. Leavening is achieved through the use of baking powder or, when using buttermilk, baking soda. Biscuits are usually referred to as either "baking powder biscuits" or "buttermilk biscuits" if buttermilk is used rather than milk as a liquid. A Southern regional variation using the term "beaten biscuit" (or in New England "sea biscuit") is closer to hardtack than soft dough biscuits. It is interesting that these soft biscuits (such as scones) are common to Scotland and Guernsey, and that the term biscuit as applied to a soft product was retained in these places, and in America, whereas in England it has completely died out. Dutch speculaas biscuit in various shapes: ship, farmhouse, elephant, horse. The Old French word bescuit is derived from the Latin words bis (twice) and coquere, coctus (to cook, cooked), and, hence, means "twice-cooked". [n 1] This is because biscuits were originally cooked in a twofold process: first baked, and then dried out in a slow oven. This term was then adapted into English in the 14th century during the Middle Ages, in the Middle English word bisquite, to represent a hard, twice-baked product. (see the German Zwieback) The Dutch language from around 1703 had adopted the word koekje ("little cake") to have a similar meaning for a similar hard, baked product. The difference between the secondary Dutch word and that of Latin origin is that, whereas the koekje is a cake that rises during baking, the biscuit, which has no raising agent, in general does not (see gingerbread/ginger biscuit), except for the expansion of heated air during baking. When continental Europeans began to emigrate to colonial North America, the two words and their "same but different" meanings began to clash. The words cookie or cracker became the words of choice to mean a hard, baked product. Further confusion has been added by the adoption of the word biscuit for a small leavened bread popular in the United States. According to the American English dictionary Merriam-Webster, a cookie is a "small flat or slightly raised cake". A biscuit is "any of various hard or crisp dry baked product" similar to the American English terms cracker or cookie, or "a small quick bread made from dough that has been rolled out and cut or dropped from a spoon". In a number of other European languages, terms derived from the latin bis coctus refer instead to yet another baked product, similar to the sponge cake; e.g. Spanish bizcocho, German Biskuitmasse, Russian бисквит (biskvit), Polish biszkopt. In modern Italian usage, the term biscotto is used to refer to any type of hard twice-baked biscuit, and not only to the cantuccini as in English-speaking countries. The need for nutritious, easy-to-store, easy-to-carry, and long-lasting foods on long journeys, in particular at sea, was initially solved by taking live food along with a butcher/cook. However, this took up additional space on what were either horse-powered treks or small ships, reducing the time of travel before additional food was required. This resulted in early armies' adopting the style of hunter-foraging. The introduction of the baking of processed cereals including the creation of flour provided a more reliable source of food. Egyptian sailors carried a flat, brittle loaf of millet bread called dhourra cake while the Romans had a biscuit called buccellum. Roman cookbook Apicius describes: "a thick paste of fine wheat flour was boiled and spread out on a plate. When it had dried and hardened, it was cut up and then fried until crisp, then served with honey and pepper." Many early physicians believed that most medicinal problems were associated with digestion. Hence, for both sustenance and avoidance of illness, a daily consumption of a biscuit was considered good for health. Hard biscuits soften as they age. To solve this problem, early bakers attempted to create the hardest biscuit possible. Because it is so hard and dry, if properly stored and transported, navies' hardtack will survive rough handling and high temperature. Baked hard, it can be kept without spoiling for years as long as it is kept dry. For long voyages, hardtack was baked four times, rather than the more common two. To soften hardtack for eating, it was often dunked in brine, coffee, or some other liquid or cooked into a skillet meal. At the time of the Spanish Armada in 1588, the daily allowance on board a Royal Navy ship was one pound of biscuit plus one gallon of beer. Samuel Pepys in 1667 first regularised naval victualling with varied and nutritious rations. Royal Navy hardtack during Queen Victoria's reign was made by machine at the Royal Clarence Victualling Yard at Gosport, Hampshire, stamped with the Queen's mark and the number of the oven in which they were baked. When machinery was introduced into the process the dough was thoroughly mixed and rolled into sheets about 2 yards (1.8 m) long and 1 yard (0.9 m) wide which were stamped in one stroke into about sixty hexagonal shaped biscuits. This left the sheets sufficiently coherent to be placed in the oven in one piece and when baked they were easy to separate. The hexagonal shape rather than traditional circular biscuits meant a saving in material and were easier to pack. Biscuits remained an important part of the Royal Navy sailor's diet until the introduction of canned foods. Canned meat was first marketed in 1814; preserved beef in tins was officially added to Royal Navy rations in 1847. Early biscuits were hard, dry, and unsweetened. They were most often cooked after bread, in a cooling bakers' oven; they were a cheap form of sustenance for the poor. By the seventh century AD, cooks of the Persian empire had learnt from their forebears the techniques of lightening and enriching bread-based mixtures with eggs, butter, and cream, and sweetening them with fruit and honey. One of the earliest spiced biscuits was gingerbread, in French, pain d'épices, meaning "spice bread", brought to Europe in 992 by the Armenian monk Grégoire de Nicopolis. He left Nicopolis Pompeii, of Lesser Armenia to live in Bondaroy, France, near the town of Pithiviers. He stayed there for seven years and taught French priests and Christians how to cook gingerbread. This was originally a dense, treaclely (molasses-based) spice cake or bread. As it was so expensive to make, early ginger biscuits were a cheap form of using up the leftover bread mix. With the combination of the Muslim invasion of the Iberian Peninsula, and then the Crusades developing the spice trade, the cooking techniques and ingredients of Arabia spread into Northern Europe. By mediaeval times, biscuits were made from a sweetened, spiced paste of breadcrumbs and then baked (e.g., gingerbread), or from cooked bread enriched with sugar and spices and then baked again. King Richard I of England (aka Richard the Lionheart) left for the Third Crusade (1189–92) with "biskit of muslin", which was a mixed corn compound of barley, rye, and bean flour. As the making and quality of bread had been controlled to this point, so were the skills of biscuit-making through the craft guilds. As the supply of sugar began, and the refinement and supply of flour increased, so did the ability to sample more leisurely foodstuffs, including sweet biscuits. Early references from the Vadstena monastery show how the Swedish nuns were baking gingerbread to ease digestion in 1444. The first documented trade of gingerbread biscuits dates to the 16th century, where they were sold in monastery pharmacies and town square farmers markets. Gingerbread became widely available in the 18th century. The British biscuit firms of McVitie's, Carr's, Huntley & Palmer, and Crawfords were all established by 1850. Along with local farm produce of meat and cheese, many regions of the world have their own distinct style of biscuit due to the historic prominence of this form of food. Sweet biscuits are commonly eaten as a snack food, and are, in general, made with wheat flour or oats, and sweetened with sugar or honey. Varieties may contain chocolate, fruit, jam, nuts, ginger, or even be used to sandwich other fillings. The digestive biscuit and rich tea have a strong identity in British culture as the traditional accompaniment to a cup of tea and are regularly eaten as such. Some tea drinkers "dunk" biscuits in tea, allowing them to absorb liquid and soften slightly before consumption. 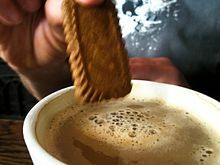 Chocolate digestives, Rich tea, and Hobnobs were ranked the UK's top three favourite dunking biscuits in 2009, with custard creams coming third in a non-dunking poll. Savoury biscuits or crackers (such as cream crackers, water biscuits, oatcakes, or crisp breads) are usually plainer and commonly eaten with cheese following a meal. Many savoury biscuits also contain additional ingredients for flavour or texture, such as poppy seeds, onion or onion seeds, cheese (such as cheese melts), and olives. Savoury biscuits also usually have a dedicated section in most European supermarkets, often in the same aisle as sweet biscuits. The exception to savoury biscuits is the sweetmeal digestive known as the "Hovis biscuit", which, although slightly sweet, is still classified as a cheese biscuit. Savoury biscuits sold in supermarkets are sometimes associated with a certain geographical area, such as Scottish oatcakes or Cornish wafer biscuits. 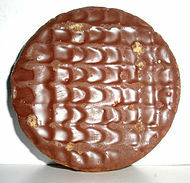 In general, the British, Australians, South Africans, New Zealanders, Indians, Pakistanis, Sri Lankans, Singaporeans, Nigerians, Kenyans, and the Irish use the British meaning of "biscuit" for the sweet biscuit, the terms biscuit and cookie are used interchangeably, depending on the region and the speaker, with biscuits usually referring to hard, sweet biscuits (such as digestives, Nice, Bourbon creams, etc.) and cookies for soft baked goods (i.e. chocolate chip cookies), In Canada, this term is now used less frequently, usually with imported brands of biscuits or in the Maritimes; however, the Canadian Christie Biscuits referred to what Americans would call crackers. This sense is at the root of the name of the United States' most prominent maker of cookies and crackers, the National Biscuit Company, now called Nabisco. North American biscuit with a firm browned crust and a soft interior. In the United States and parts of Canada a biscuit is a small bread with a firm browned crust and a soft interior. These biscuits are particularly popular in the American South, where generations have passed down family recipes. They are made with baking powder or baking soda as a chemical leavening agent rather than yeast (a quick bread) although they can also be made using yeast (and are then called angel biscuits) or a sourdough starter. They are traditionally served as a side dish with a meal. As a breakfast item they are often eaten with butter and a sweet condiment such as molasses, light sugarcane syrup, maple syrup, sorghum syrup, honey, or fruit jam or jelly. With other meals, they are usually eaten with butter or gravy instead of sweet condiments. However, biscuits and gravy (biscuits covered in country gravy) or biscuits with sausage are usually served for breakfast, sometimes as the main course. A biscuit may also be used to make a breakfast sandwich by slicing it in half and placing eggs and/or breakfast meat in the middle. ^ "cookie". Oxford English Dictionary. Oxford University Press. In Scotland the usual name for a baker's plain bun; in U.S. usually a small flat sweet cake (a biscuit in U.K.), but locally a name for small cakes of various form with or without sweetening. Also S. Afr. and Canad. ^ "Baking Powder Biscuits Source: U.S. Department of Defense". Theodora's Recipies [sic]. Retrieved 20 December 2013. ^ Olver, Lynne. "The Food Timeline: history notes--cookies, crackers & biscuits". ^ "Biscuit". askoxford.com. Retrieved 14 January 2010. ^ a b c "Biscuit". Merriam-Webster. Retrieved 14 January 2010. ^ a b "Cookie". Merriam-Webster. Retrieved 14 January 2010. ^ a b c "Ship's Biscuits – Royal Navy hardtack". National Museum of the Royal Navy. 2000. Archived from the original on 31 October 2009. Retrieved 14 January 2010. ^ "Bisquet". Cyclopaedia, or an Universal Dictionary of Arts and Sciences. I. Ephraim Chambers. 1728. p. 105. Retrieved 3 May 2013. ^ The National Cyclopaedia of Useful Knowledge, Vol III, (1847), London, Charles Knight, p.354. ^ a b c "Biscuits & Cookies". Food Timeline. Retrieved 15 January 2010. ^ "La Confrérie du Pain d'Epices". Archived from the original on 22 March 2010. Retrieved 4 November 2009. ^ "Monastère orthodoxe des Saints Grégoire Armeanul et Martin le Seul". Monastere-saintgregoire.net. Archived from the original on 15 December 2013. Retrieved 10 August 2013. ^ "Biscuits". greenchronicle.com. Retrieved 14 January 2010. ^ Alan Davidson (1999). Oxford Companion to Food. Oxford University Press. ^ a b "Chocolate digestive is nation's favourite dunking biscuit". The Telegraph. 2 May 2009. Retrieved 28 December 2014. ^ "Cheese Biscuits Source: U.S. Department of Defense". Theodora's Recipies. Retrieved 20 December 2013. This page was last edited on 22 April 2019, at 22:11 (UTC).